Oh god, oh my glob, oh my! Valve’s latest Team Fortress 2 ARG has just hit top gear. There were jokes in the melted capacitor. There’s a third Mann brother, Gray Mann, who has revealed himself to siblings Blutarch and Redmond having been kidnapped as a newborn by an eagle during the Great Eagle Scourge that plagued London in the early 19th century. Saxton Hale won the fiction rights to the Alamo in a game of poker with the American president. Previous Mann vs Machine clues make a tiny bit more sense. Mann vs Machine is surely afoot! 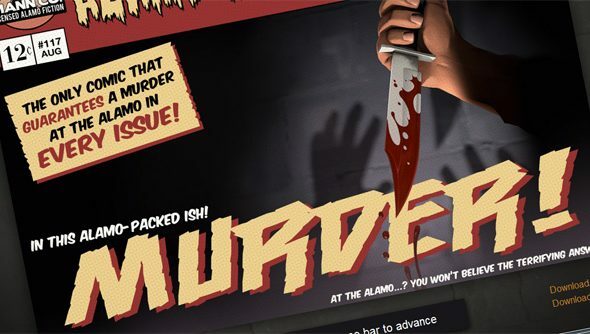 Here’s the Blood Brothers comic, which was revealed following the decoding of a series of jokes discovered by equipping a capacitor in TF2 and high-fiving other players. The jokes were all of the form “Did you hear the story from 1289 where Reserver Shooter, Holiday Punch, Your Eternal Reward, Ol’ Snaggletooth, Outdoorsman, Cow Mangler 5000, Archimedes, Cadaver’s Cranium, and the Administrator walked into a bar?”, each spooling off a different year and list of items. When ordered by year, with each item then ordered alphabetically, the ‘jokes’ corresponded with data values that… somehow… led to URLs, QR codes and zip files which, when all combined, eventually pointed towards the Blood Brothers comic.This followed the earlier reveal of Zephamia Mann’s willand Gray Mann’s birth certificate (which corroborates Saxton Hale’s account of the newborn’s absconding with an eagle). Truly, taking part in Valve’s ARGs has nowleft the domain of the average player. Still, if you want to feel involved, you can go look at the giant ‘carrier tanks’ that can now be seen hiddenin the backgrounds of 2fort, Granary, Badwater Basin and Doublecross, suggesting some imminent arrival of genius, estranged, partially mechanised brother Gray Mann. Are we about to see a third, mechanisedteam introduced to Team Fortress 2? The comic suggests a sort of truce was about to be brokered between Red and Blu – might they fight alongside one another in the next update? A unified force rising up against the horrifying robotic legion? Time, only that will tell us. Here’s the perplexing story of the the Mann vs Machine ARG so far.